I don’t think it is healthy to eat any vegetable oils, even olive oil, on a regular basis. BUT, salads are SO HEALTHY and necessary to eat daily…Here is my favorite and only dressing that has very little olive oil. 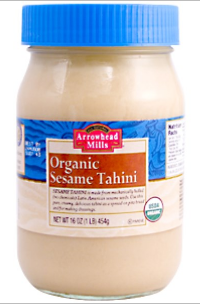 AND tahini, sesame seed butter, as an awesome source of calcium! 2. Add all remaining ingredients and puree again until smooth.